Amazon just announced the next major update to its Kindle software, version 2.5. It’s about to start rolling out to some users, to see a full rollout in May (pretty sure it’s already May, Amazon–check your farmers’ market. They’ll be selling asparagus. May.). 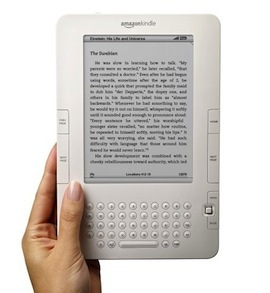 This is the second major firmware update to an e-book reader post-iPad–Barnes & Noble released theirs a few weeks ago. So what does Amazon bring to Kindle version 2.5? There’s “collections,” which seem mostly like folders to me–you can organize your books or whatever else into these collections. There’s now a password protection, in case you don’t want anyone to know you’re reading Dan Brown, and you can zoom and pan around PDFs, in case you have a death wish for your eyeballs and want to punish them with slow-refreshing e-ink. But the biggest update has to be Facebook and Twitter integration. We’re not really sure exactly how it’ll be implemented, but Amazon says you’ll be able to share book passages with friends via Facebook and Twitter. Will Amazon upload snippets to the cloud and offer a link? Or will it only be viewable for other Kindle users? Who knows. But it’s kind of a cool idea–I was just reading Reality Matters this week, and wanted to share the section on The Real Housewives of New York City with a friend who happens to live across the country. Hopefully this update will provide a way to make that vital exchange of ideas possible.